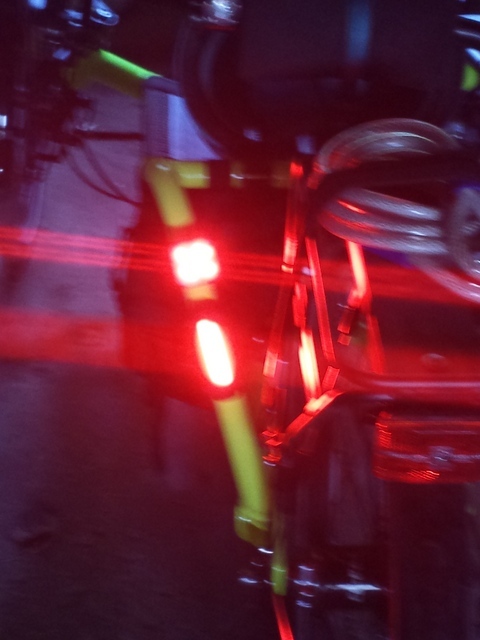 Maybe you are starting to think that I am obsessed with bicycle lights. Well, I am interested in the subject, but not to the point of obsession, it’s just that as I add to the stable of bikes I own, I keep needing to outfit them with lights for my safety and I keep looking for new, better models. The technology keeps getting better and manufacturers keep coming up with different models that suit different needs. I’ve found lights for one bike that I wouldn’t use on another bike. Others are good all-round. Read my other posts about bike lights. It’s really tough to measure brightness, but lights are getting brighter in general, but the race to the top for brightest is dying down. A couple of companies now make lights that are in the overkill range and there is no longer any reason to keep on getting brighter. DiNotte even sells one model with a disclaimer you must accept saying that you won’t use it at night. But many consumer level lights in the $30-50 range are now bright enough to be considered “daytime-bright.” In other words, bright enough to be of use as a warning to motorists even during the daytime. My latest purchase in a bike tail light is the Serfas Thunderbolt. I’ve been watching this light for over a year now and finally decided to buy one after reading some good comments about it’s brightness. I liked the way it attaches to the bike and decided it would be one of the few possibilities to fit the bar on the back of the seat on my Tour Easy. 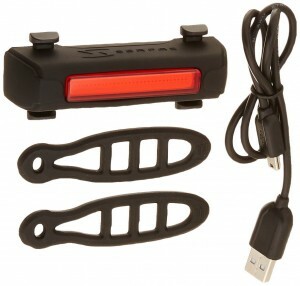 It’s another USB rechargeable Li-Ion powered light. It is encased in some kind of silicone plastic and is supposed to be waterproof. It attaches to any tube or bar on a bike that you can wrap the two silicone bands around, making it very versatile. It’s one of the few I’ve seen that is equally at home on a recumbent and a diamond-frame bike. It charges with a mini-USB cable, which they supply. You still have to find a place to plug that into. The socket for charging is on the back of the light and has a small rubbery cover that you need to pop open. This also means that you can’t charge it on the bike, you need to remove it. Fortunately, the bands make that easy. For ease of charging, it’s about equal with the Knog Blinder 4 that I wrote about. The light has four modes selected by a button on the top of the light. Well, not much of a button, mostly a place in the casing that you press in. It comes on in a solid bright mode and it is bright! The package has a warning not to look at it close up. Pressing the button again selects a dimmer, but still on solid mode. A third and fourth press get bright/blinking and dim/blinking respectively. Dim isn’t really dim, except in comparison to the bright mode. It would make a great night time setting to save battery life. The manufacturer claims an 8.5 hour runtime in the dim/blink mode, with progressively shorter times for brighter or solid modes. Solid-bright mode was 1.5 hours, if I recall. A fifth press turns off the light, which causes it to gently fade out, rather than just stop suddenly. A nice touch from the programmers. I’ve uploaded a couple of blurry photos. The intention is to show the brightness, not high detail, but you should see how neatly the Thunderbolt fastens to the crossbar on the seat back of the Tour Easy. I’d actually like to replace the Planet Bike light with another Thunderbolt. Here is the Thunderbolt just below the Knog Blinder 4 on my Catrike. Here’s a comparison of the Knog Blinder 4 and the Thunderbolt. In all these cases, it’s hard to pick a winner. The LEDs in the Thunderbolt are in a bar and the light is spread over a couple inches. It’s still very bright, but lacks a pinpoint source. For eye-catching intensity, though, it’s still very good. I’d put it a notch above the Planet Bike and about equal to the Blinder 4. I bought a USB charger with two outlets to use with the Knog lights. 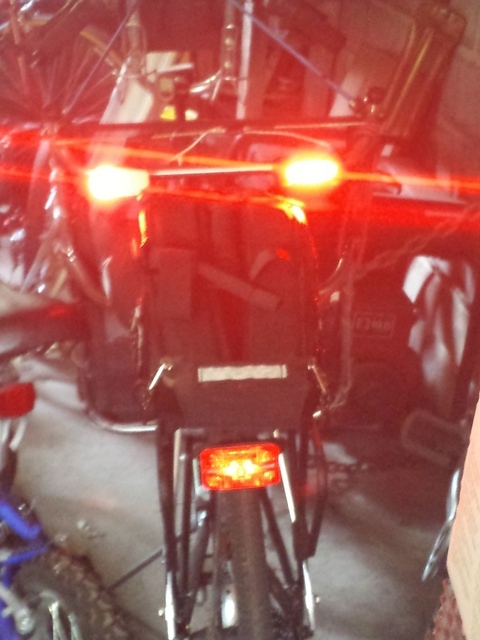 (I have a set on the Catrike, headlight and taillight and I’ve found them more useful than I expected.) It worked fine to charge the Serfas light as well. I’m getting so that I now have enough rechargeable lights that I need to make a charging station in the garage. I have a power strip with two USB outlets built-in and a 4-AA or AAA charger for the batteries for the Dinotte 120R. Then there is the two wal-warts for the headlights I have been using. I don’t ride at night much, but I like to be able to if I want, or get caught out late. I do insist on having a daylight-bright rear light at all times, unless I’m on a trail with no cars. The Dinotte is the choice there and it makes a noticeable difference in how passing motorists behave when they pass me. I make no apologies for using the road as I’m entitled to, but I want to make it as easy to get along as possible. The sooner a car driver sees me the more time they have to respond accordingly. Usually, it’s a simple matter to pass and no stress for anyone involved.